Foreign Policy has an article on their website with reflections from Nassim touching on Fragility/Antifragility, the stability of countries, city-states and decentralizing government, Lebanon, the European Union, and US deficits, titled Epiphanies from Nassim Nicholas Taleb. 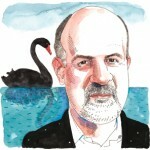 Nassim Nicholas Taleb has made a career of going against the grain, and he has been successful enough that the title of his book The Black Swan is a catchphrase for global unpredictability far beyond its Wall Street origins. Born in Lebanon, he weathered the first few years of the civil war in the late 1970s reading philosophy and mathematics — from Plato to Poincaré — in his family’s basement. War taught him how quickly fortunes can change, an insight he soon applied to derivatives markets. For Taleb, investing is about “hyper conservatism,” which includes making lots of tiny bets on wildly unlikely events — like a currency crisis or the banking collapse, on which he made tens of millions of dollars. His newest project is helping governments get smarter about risks, and his fervent anti-euro message has helped win him the ear of British Prime Minister David Cameron. Looks like a preview of what to expect from the economics and econophaster establishment. Davies is the gentleman there; others have not even given a simple thougth to model error and which domains are affected by it. But asking people to explain insults can lead to pleasant surprises. This morning, Nassim Taleb returned to Twitter, posting one of the technical appendices to his new book. And immediately he got into a wonderfully wonky twitterfight/conversation with Daniel Davies. I don’t pretend to understand all the subtleties of the conversation between the two, but, for Tom Foster, here’s an attempt. Davies has promised a Crooked Timber post on other parts of the appendix; I’m really looking forward to that. Nassim Taleb has posted a link to the technical Appendix II of his new upcoming book Antifragile on his website. On his Facebook Page Nassim Taleb has linked to a new note on his Philosophical Notebook page on his website. Nassim has released the “Medicine and Convexity (Antifragility), a summary (technical) sheet” on his Facebook Page. A brief explanation of nonlinearities as detection of risk in medicine (from antifragile), directly from mathematical necessities, or the ideas behind Antifragile. In the presence of a layer of metaprobabilities (from metadistribution of the parameters), the asymptotic tail exponent corresponds to the lowest possible tail exponent regardless of its probability. The problem explains “Black Swan” effects, i.e., why measurements tend to chronically underestimate tail contributions, rather than merely deliver imprecise but unbiased estimates. In the presence of a layer of metaprobabilities (from metadistribution of the parameters), the asymptotic tail exponent corresponds to the lowest possible tail exponent regardless of its probability. The problem explains “Black Swan” problems, i.e., why measurements tend to chronically underestimate tail effects, rather than merely deliver imprecise but unbiased estimates. Professor Nassim Nicholas Taleb talks about how systems, including evolution, can withstand shocks to them and are able to improve because of it and those systems that reject it, such as modern politics and banking.